In the original lyric from Bob Dylan's Greatest Hits Vol. 2, 1971, Dylan hurries back to his hotel room because he has "a date with Botticelli’s niece." It is this niece who promised "she'd be right there" when Dylan paints his masterpiece. How often do you think these things are just because he forgot the lyrics and made up nonsense filler to keep going? Ed, this is hard to say. This particular lyric entry is the second time in that performance the "grease" verse was sung, a strong indicator that this "rewrite" was not made up on the spot. It's also sung clearly and confidently, another reason to think it might have been pre-planned. However, this may all be undermined by the fact that the first time the verse is sung in this performance it is not fully formed and is hard to decipher. Also, while not an unusual thing with Dylan, it's hard to comprehend the meaning! We will post if we find any repeats of this lyric variant in other performances. Readers should feel free to add comments here if you know of any! By the way, we're using a tag of "Improvisation" to recognize the more obvious made-up-on-the-spot instances, like our 08 Nov 1990 Gotta Serve Somebody entry, for example. 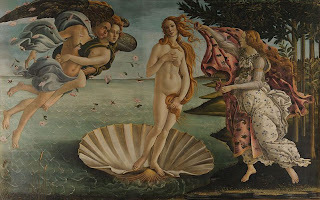 On this particular song, as well as the variant quoted, he has at times used "a pretty little girl from Greece" as an alternative to "Boticelli's neice." And who might she be ?